Ansonia Clock Co. Crystal Regulator, "Excelsior", ca 1904. This may not be the biggest and best crystal regulator Ansonia made, but it is my favorite. Over their lifetime the gold or brass finish wore off or tarnished badly. This one was redone by Bruce Baziluk. He first disassembles the case piece by piece and sends everything but the glasses and movement, to have all the pieces gold plated. Ansonia finished most of them in brass. I prefer the gold and have had all of mine refinished in gold. The metal underneaththe finish is real bronze. They all have 8 day movements, and strike halfhours on a standing cathedral gong. 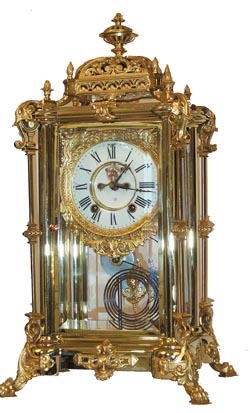 2 piece porcelain dial is perfect, outsideescapement with jeweled pallets, and is running beautifully. Note the ornategold pendulum with embossed ladies bust. There is nothing plain about thisclock, if you like plain there are other things in this catalog. We try tohave something for everyone. Ly-Ansonia, page 117.